Every Thursday is a special day at Dew Drop Inn because Thursdays are Steak Day! For $14.95 you get this plate of AWESOMENESS! 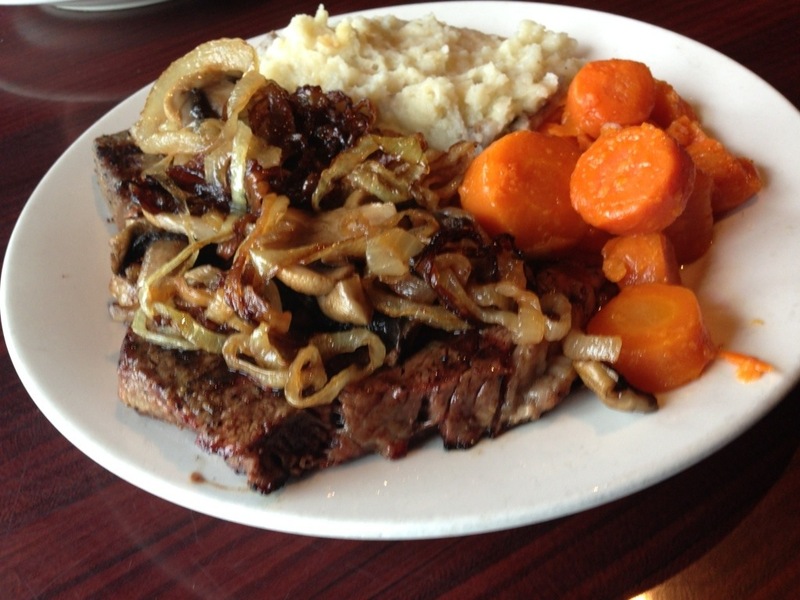 The steak is seasoned and delicious by itself, but if you prefer to add another layer of flavor try it with fried onions and mushrooms for an additional $2. Along with a steak you also get mashed potatoes and glazed carrots. The mashed potatoes are slightly lumpy, as mashed potatoes should be, and the carrots are a little sweet – just the way I like them – so that you’ll want to eat them all. In fact, you’ll want to clean your plate once you take a bite!